The Pansonic G3 is 25% lighter than the Lumix G2 it replaces. Panasonic will add another Micro Four Thirds camera to its growing lineup of Lumix cameras with the release of the Panasonic G3, the company has announced. 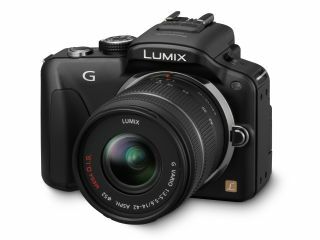 The G3 will serve as the Panasonic G2 replacement and comes 25% smaller than its predecessor, the company says. Production of the Lumix G2 will still continue, however, as the camera drops down to Panasonic's entry-level range. Boasting the same processor as the high-end Panasonic GH2, the Lumix G3 also contains 15.8 million effective pixels and a faster autofocus. Panasonic claims the Lumix G3 has 'the world's fastest pinpoint autofocus speed' at approximately 0.1secs, with a range of AF modes, including Face Detection, AF Tracking and multiple-area AF with up to 23 focus areas. Like many other new Panasonic cameras, the G3 contains touchscreen functionality, allowing users to change the size of the AF area and move it around by touching the LCD. The Panasonic G3's LCD is a 460,000-dot, free-angle screen that rotates from 180 degrees from side to side and tilts 270 degrees up and down. Photographers can also use the Lumix G3's built-in Electronic Viewfinder. Panasonic has boosted burst shooting with the Lumix G3 to up to 4fps capability at full resolution and 20fps at 4 megapixels. Other key features of the Panasonic G3 include full HD video recording and a high ISO of 6400 - a one step improvement over the Panasonic GH2. The Panasonic G3 price tag will be similar to the G2, Panasonic says, costing around £629-£649.